Alexandre Le Brun is a one man show. 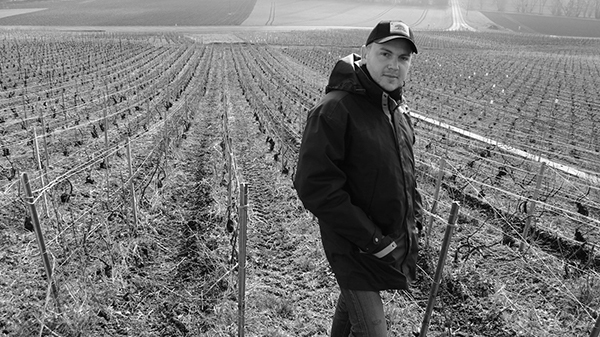 He describes himself as a “crazy winemaker” and visiting his cellar in Monthelon is a trip that is always full of surprises and great Champagne. This year, we were treated to a great welcome in the little village of Monthelon by Alex and Ninja, his adorable nine month old cat. He took us out to the vineyard, and we visited the plot called Les Chapelles, named for the chapel behind it, where he grows Meunier. In most vintages, he sells between two-thirds and three-fourths of his production as juice to negociants, but for 2017 he decided to sell almost all of it. He was fortunate enough to be spared from the spring frost that ravaged the vineyards of so many of the producers, but was very unhappy with the rot that set in during an incredibly wet and hot August. 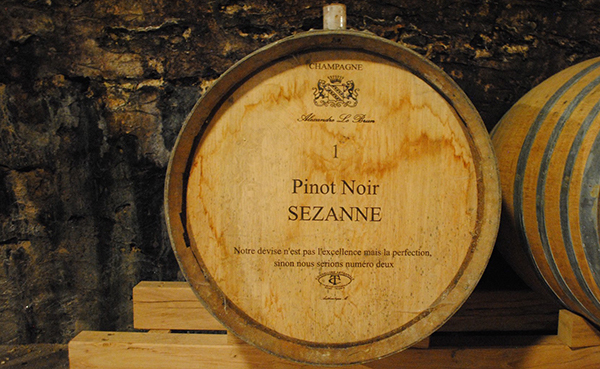 Since the big houses always need more juice, it was easy to sell off the production that he did not want, just saving a little bit- one tank of Sezanne and a few barrels of Chouilly and Monthelon. The wines that he did save clearly benefited from this very strict selection. While most other producers in the region have wines that are finished with their fermentations, Alex’s are still actively going through malo or still have sugar that has not fermented out. He runs some of the slowest fermentations in the region, and just like at Billecart-Salmon believes that going slower gives purer, more expressive wines at the end. This is expensive, because the region does not count any ageing except for the ageing on the lees in the bottle, but for Alex, it doesn’t matter, he does not sell anything that isn’t at least four years old by the time it gets into your glass. When we sat down to taste, he opened up the best young vintage Champagne of the trip, his 2012 Revelation, which is entirely Meunier from Monthelon, made from ancient massal selected vines and barrel fermented in his cold cellar. It won’t arrive until the end of the year, as it has just been recently disgorged and needs more time to settle before shipping. This wine exploded from the glass with top-notch aromas of exotic pear and tart crust. In the mouth, it was more focused and energetic than any Meunier I have ever had, without losing the vinous complexity that makes vintage Meunier so interesting. I have not had a Meunier Champagne this exciting since the days of Rene Collard! The cold climate and his meticulous craft have yielded something special here, but with less than 2000 bottles available, I don’t know how much I will be able to talk him out of! We have only six bottles left of our five cases of the 2009 Alexandre Le Brun "Cuvée Revelation" Brut Champagne left in stock, and if you love Meunier Champagne, it is the best one in the store by a wide margin. I love this Champagne for pate of all types, but especially for foie gras. It shows the extra energy of this cold climate Meunier with the slow fermentation process perfectly even in such a ripe vintage. Get it before I come back and buy it all for my own cellar! I am happy to report that we talked Alex into coming back for the tent event this year, so you can meet him in person in LA and San Francisco. More on that later! A Champagne Trek Continues...to Baron-Fuenté!